In the house plan I want to build the mudroom and the laundry room are the same. I will have a bit of a organizing issue with this but I think I can make it work. 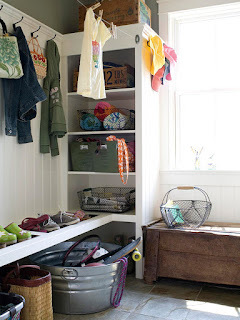 I want my mudroom to have a lot of storage in it. Right now I get bags and shoes and jackets thrown on the floor wherever they feel like it. It would be nice to have a place to make them put it. I love the bright yellow vase in this picture above. I also love the wall paper. Just a thought. The bag is lovely. 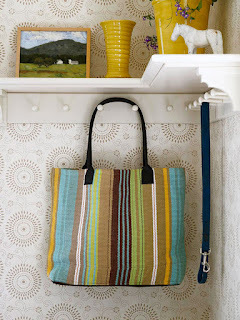 The colors would be perfect for a mud room. The browns, greens yellow and blue it's great. Rufus Design Company. Picture Window theme. Theme images by dino4. Powered by Blogger.